Some 297 candidates, including 20 women, are in the fray for the February 18 Tripura Assembly polls, an official said here on Sunday. Tripura Chief Electoral Officer (CEO) Sriram Taranikanti said 320 candidates had submitted their nominations out of which candidatures of 13 were cancelled. On the last date of withdrawal on Saturday, 10 candidates withdrew their nominations. Those who withdrew include Congress candidate Sukumar Chandra Das, former Tripura Chief Minister Samir Ranjan Barman and Tribal-based party Indigenous Nationalist Party of Tripura’s (INPT) Tarani Sadhan Jamatia. Das, who had filed for Kakraban-Shalgarha assembly seat on a Congress ticket joined the Bharatiya Janata Party (BJP) on Saturday night. Barman said he took the decision after requests by BJP state president Biplab Kumar Deb and Assam minister Himanta Biswa Sarma, who is BJP’s election in-charge for Tripura. The CEO said that in all 25, 79,060 electorates, including 12, 67,785 females, are eligible to cast their votes on February 18 to elect a new 60-member assembly. 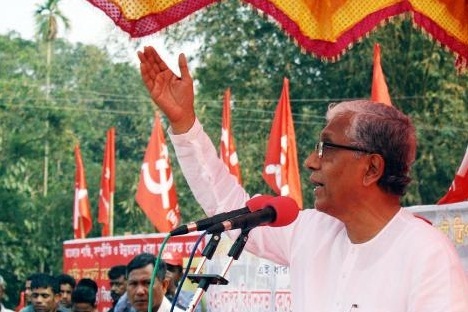 The ruling Communist Party of India-Marxist (CPI-M) has fielded 57 candidates leaving one seat each to its Left Front partner Communist Party of India, Forward Bloc and Revolutionary Socialist Party. The BJP is contesting from 51 seats. It has left nine seats for its electoral ally, the Indigenous People’s Front of Tripura (IPFT). Congress candidates have filed from 59 constituencies. Trinamool Congress has nominated 24 candidates. The Election Commission has appointed 25 general observers, eight police observers and 19 expenditure observers to oversee the poll process in Tripura. Over 30,000 civil officials would be engaged to conduct the single phase assembly elections. Besides, the poll panel, on the request of the state government, would deploy more than 30,000 additional central para-military forces before the elections.